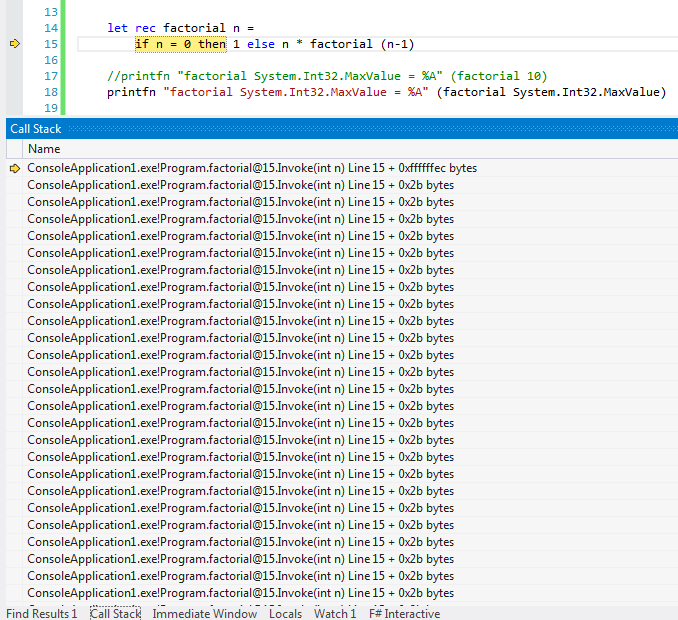 We continue our journey into F#, and this time we will look at recursion. We have already seen this in a number of places, namely when we talked about Lists and also Pattern Matching. So some of this should be vaguely familiar to you. Lets start with the most basic example which is typical of what we have seen before. This example simply adds all the elements in a input list. We put a pattern match in against an empty list. So why did this happen? What did we do wrong? Well if we turn our attention to the actual Visual Studio IDE and look at the “CallStack” window, we can see some pointers as to why this may be happening. What you should be asking yourself is, is there a better way I could have written my code to avoid this? Well yes there is, it is called “Tail Recursion”, which also uses a technique called the “Accumulator Pattern”. What does the “Accumulator Pattern” actually mean. For all intents and purposes it really means that we pass an extra value into the function, which is a accumulation value that you can use with each iterative call. This simply change means we no longer need to push things on to the stack to keep the temporary value, obviously the stack is still involved with the recursion itself, but we do not have to push unnecessary values to the stack, As a result the compiler is able to optimize the code. Ok, lets see the new / better code (for the sake of me not having to wait too long to see a result, I have gone for a small value of “5”, but rest assured you would not get a StackOverFlowException thrown if you use this technique, for larger numbers. It can be seen that I have used a non recursive function that is called, that function called contains a nested function which does the recursion, and is called with an initial accumulator value and the original function input value. Here is the decompiled C# code for the optimized tail recursive version, where we can see that this has been converted into a simple for loop which is ALL contained in a single call to the Invoke() method. Which puts us in a much better/happier place. It can be seen that this time we get a while loop in the Invoke() method call. I don’t know if this adds any value to the post, but I just wanted to see what would happen if I swapped the order and had no nested function, and instead went for 2 functions instead of one function that had an inner function. There is another way to deal with recursion which uses a callback based technique, but too be honest I have found it not to be that easy to understand, and a little hairy for right here, right now. If you are interested I am sure a quick Google around will get you what you want. So in the end this post was quite a short one for a fairly complex subject, but there is not much more I wanted to say. I think the second method called Continuation passing style.